Nike is continuing the “Risk Everything” World Cup advertising campaign “Winner Stays”, a four minute film featuring football stars, teenage boys and a group of cameo ring-ins. The teenage boys imagine themselves as Cristiano Ronaldo, Neymar Jr., Wayne Rooney, Zlatan Ibrahimović, Gerard Piqué, Gonzalo Higuaín, Mario Götze, Eden Hazard, Thiago Silva, Andrea Pirlo, David Luiz, Andrés Iniesta, Thibaut Courtois, and Tim Howard. 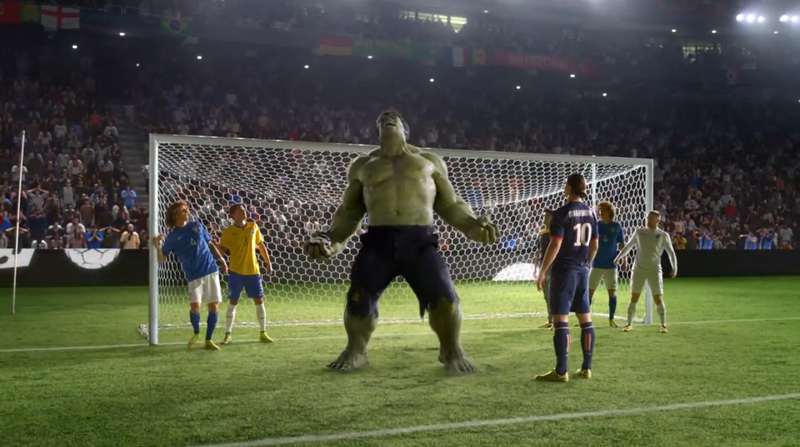 Cameo appearances include The Hulk, Kobe Bryant, MMA stars Jon Jones and Anderson Silva and supermodel Irina Shayk. 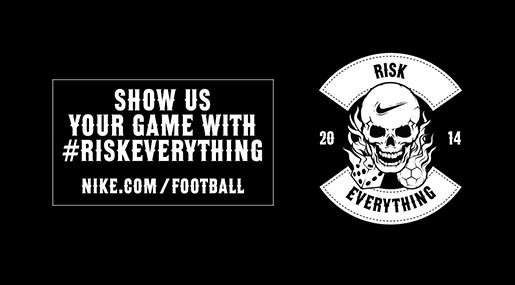 Viewers are invited to share their best football moments on the #RiskEverything site, nike.com/riskeverything, for a chance to be featured in a Nike highlight reel. The Risk Everything campaign was developed at Wieden+Kennedy, Portland, by executive creative directors Mark Fitzloff, Susan Hoffman and Joe Staples, creative directors Alberto Ponte and Ryan O’Rourke, copywriter Jess Salomonsson, art director Sezay Altinok, interactive director Dan Viens, agency producer Endy Hedman, production assistant Julie Gursha, agency executive producer Matt Hunnicutt, head of production Ben Grylewicz, account team Karrelle Dixon, Alyssa Ramsey and Ricardo Hieber, business affairs director Laura Caldwell. Filming was shot by director Ringan Ledwidge via Rattling Stick with executive producer Jen Barrons, head of production Joe Biggins, director of photography Ben Seresin, and line producer Sally Humphries. Editor was Rich Orrick at Work Post with producer Sari Resnick and assistant editor Eleanor McNaughtan. Visual effects were produced at The Mill by senior executive producer Sue Troyan, executive producer Gemma Humprhies, executive colour producer LaRue Anderson, producer Christina Thompson, colour producer Natalie Westerfield, project lead/creative director Tom Bussell, production coordinators Benjamin Sposato and Clare Melia, shoot supervisors Tom Bussell, Austen Humphries and Andrew Wood, lead senior 2D artist John Shirley, creative director Andrew Wood, colourist Adam Scott, designers Kyle Moore and Greg Park, 2D artists Grant Connor, Peter Hodsman, Siro Valente, Jonathan Westley, Zoe Cassey, Frank Hanna, Gary Driver, Joseph Tang, Tim Davies, Adam Labert, Brad Scott, Olivia O’Neil, Patrick Heinen, Patrick Munoz, Eleanor Risdon, Ben Smith, Daniel Thursesson, Jake Maymudes, Martin Karlsson, Cameron Smither, Gianluca Di Marco, Andy Godwin, Zoe Cassey-Hayes, Paul Downes, Georgina Ford, Scott Wilson, 3D Artists Tom Raynor, Adam Droy, Adam Darrah, Phillip Maddock, Edward Hicks, Paul Donnellan, Charlotte Akehurst, Arthur Larsen, Sergio Xisto, Rebecca Ferguson, Tom Graham, Mathew Fuller, Anthony Northman, Jake Flint, Hartwell Durfor, Danny Yoon, Michael O’Donoghue, Marta Carbonell, Fabrice Le Nezet, Margaux Huneau, Vasilis Pazionis, Lucy Luong, Jake Flint, Anthony Northman, Andy Wheater. The Hulk visual effects were produced at Luma Pictures by executive supervisor Payam Shohadai, VFX supervisor Vince Cirelli, senior VFX producer Steven Swanson, commercial executive producer Vicki Mayer, VFX producer Michael Perdew, animation supervisor Raphael Pimentel, CF supervisor Richard Sutherland, CG supervisor Pavel Pranevsky, digital FX supervisor Justin Johnson, design supervisor Loic Zimmerman, look development lead Jared Simeth, character TD supervisor Thana Siripopungul, senior FX technical director John Cassella, lead digital coordinator Catherine Hughes, technical coordinator Daniel Kepler, modelling/texture team Dulshan Keragala, Cosmin Hrincu, Safari Sosebee and Oded Raz, animators Alon Helman and Marcos Romero, lighters/compositors Satoshi Harada, James Waterson, Alex Cancado, Joey Sila, Joe Censoplano, Roto/Paint supervisor Glenn Morris, lead Roto/paint artist Jessica Bakke, Roto/Paint team Cameron Sorgi, Marcel Caue Martins, Prin Nimmannitya and Garrett Wycoff. Sound was produced at Formosa Group by sound designer Julian Slater and sound producer Branwen Prestwood Smith, and mixed at Lime Studios by Rohan Young and Loren Silber, with producer Susie Boyajan. Music is “Miss Alissa” by Eagles of Death Metal.